Looking for a way to liven up broiled meat or fish? I have been! I eat WAY too many stir fries and other sauteéd dishes. I also want to eat more fish but don’t really like it unadorned. Today’s recipe is a delightful combination of almonds, apricot, scallions, lime, and ginger. It’s so easy and quick to make! It’s a great way to turn something meh into something special. 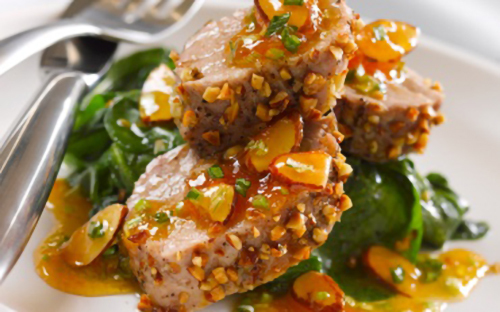 It’s truly wonderful on pork medallions or pork chops. It would also be perfect for shrimp, salmon or other fish. If you have leftovers, try a little on sliced turkey with mascarpone and greens between slices of sourdough bread for lunch. The recipe serves six. Place the almonds in a single layer in a dry skillet, and turn heat to medium. Toast for about 2 minutes, stirring occasionally. Stir all the ingredients together in a small bowl. Serve.